This is going to be one amazing match after IU's awesome performance last night. Will be a tough game today! Sarfraz shouldn't have opted to bowl given the form Watson and Sharjeel are in ???? #PSLT20 #Gladiators ???? Delchasp Muqablay Ki Bad #PeshawarZalmi Ka #KarachiKings Ko 3 Runs Se Shikast. 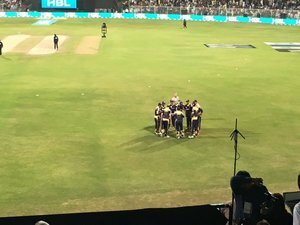 Peshawar ZALMI beat Karachi KINGS by 3 runs! People who are ranting/complaining about #Dubai games had less crowd than in #Sharjah games now; weekend hai aaj wahan! Islamabad United all the way??? ?